After a group run at Fleet Feet this past October, a group of us were standing around a camping stove making s’mores and discussing upcoming race plans. I half seriously said to the group “Hey, you should all run Devil Dog!” What I wasn’t expecting was for almost all of them to actually do it. After all, the SHORTEST distance the race offered was 100k (62 miles) and the longest any of them had run was 50k. Bekah had run as far as 50k a couple times and had ambitions of running 50 miles. I tried to convince her that it wasn’t THAT much further. At that point, Emily had never even run a marathon! Emily went on to complete the Harrisburg marathon in November only a month before attempting 100k. This run would be equivalent to running the Harrisburg Marathon, Harrisburg Half Marathon, Hershey Half Marathon, and Capital 10-miler, back to back to back to back. Or, in my case I’d have another 1.5 marathons to go to reach 100 miles. But sure enough, Bekah, Emily, Adriane, Brian and I all signed up for the Devil Dog 100k or 100 mile. Standing in the dark in 27*F and rain (yes, rain) we were wondering what we had gotten ourselves into. As if running 100k or 100 miles wasn’t challenging enough already, we had some absolutely treacherous weather to deal with. The first lap of the loop course felt more like ice skating than running. I wondered why my shirt felt so stiff, oh yea, it was frozen solid. There were quite a few wooden bridges over creeks in the park. Crossing them with the solid ice frozen over them was nearly impossible. Everyone in the race fell multiple times. You simply could not stay on your feet. The bridges that had hand railings were only passible by pulling yourself over while your feet skated. Remember as a kid finding ice in your driveway and getting a running start and power sliding across it with your feet locked in place? I watched a few guys use this tactic to cross bridges and road crossings during the race, so I gave it a try. The problem was, doing that multiple times, makes your stabilizing muscles, you know the ones you forget you have until you do something new like ice skating, hurt! The first lap of the course took me an hour longer than I expected and my legs hurt from slipping and sliding. As I began my 2nd lap I wasn’t sure if finishing was possible. I had a hard time fathoming surviving this for another 80 miles. In addition to the 5 of us running the race our friends; Jade, Jodi, and Chris had come to support us. In those early laps, I kept thinking I can’t let them down. They gave up their entire weekend to help us. I could hear rain drops in the forest. Wait, it wasn’t raining anymore. That was the glorious sound of melting ice. I was desperately looking forward to the ice melting so that the course would become more runnable, and we’d warm up a bit. The forecast, as brutal as it was in the morning actually showed the afternoon temperatures reaching the 50’s and clearing up. Focusing on positives such as warmer weather helped to keep ourselves moving. As the course dried out, I had a huge mental boost. The course was now runnable! Let’s do this! Alone, dark, legs aching, my enthusiasm had evaporated. Up to this point I had eaten a lot at every aid station, a necessary part of ultra-marathon running. But now I lost my appetite. I was having a hard time eating and food made me feel nauseous. We had run through the daylight of an entire day and I had only covered 48 miles. I hadn’t seen another runner in what seemed like hours. I felt light headed. Covering another 53 miles (course is listed as 101 miles) didn’t sound possible. I told myself to focus on getting back to camp Remi where our crew was stationed. That would be the 100k mark for me. I thought to myself, no one would be disappointed in me if I stopped at 100k in these conditions. I tried to stay optimistic, get to 100k and reassess. Bekah, Emily, Adriane, and Brian have all completed their 2nd lap. 100k competitors had to complete loop 2 by 7 p.m. to be allowed to continue. Time cutoffs can be a cruel ending to a race, but in races this long, they have to be a reality as courses can’t stay open forever. Adriane was feeling very cold and being only slightly ahead of cutoff pace, she decided not to start her 3rd loop. The other 100k runners now had until 2 a.m. on Sunday to finish or they would not count as official finishers. Jodi was now running with Bekah. Runners are allowed to have a pacer beginning with their 3rd lap. I staggered into Camp Remi. I was freezing, and wearing a skin tight light purple women’s shirt, that wasn’t mine. One of the crew members asked where I got the shirt. A volunteer at the last aid station let me borrow it. We have to bring it back, I said. It was supposed to get warmer all night, but the forest got a lot colder. I changed into some warmer clothes of my own. I ate as much as I could tolerate and had 2 cups of coffee, previously drinking one at each station. 62 miles completed. This would be my finish if I had signed up for the 100k. Why didn’t I sign up for the 100k? Chris was now running with me. I opted to wait until my 4th lap to utilize a pacer so that I would have something to look forward to in the late stages of the race when I would need a boost. Bekah was running very strong and moving up. After two laps Bekah was about an hour behind Emily, but was now gaining. Emily did not use a pacer and began to struggle on her 3rd lap. Emily too was cold, and feeling light headed. We’re all hiking more than running at this point and just focused on moving forward. Just keep moving. Chris reads the text while I’m hiking along. This dampens my already dim spirits. I wonder if any of us will finish. I thought if Emily could hang in there, we could help her. We’d be to that aid station in less than 2 hours. What about Bekah, did Bekah pass Emily? I couldn’t think straight. I was hitting my own low point. I wanted to lay down. I asked Chris if he thought it was a bad idea to lay down in the woods for 20 minutes. He said yes, that’s a bad idea. I felt awful. I was 70 miles in, how could I have more than a marathon still to go? With no other option Emily waited for help. The help came in the form of another participant. A woman, named Ellen, who was in the 100 mile race and struggling herself told Emily they would stay together. The only way back was down the trail toward the finish line. They moved forward, one step at a time. The course limit for the 100k was 2 a.m. Emily made it to the finish at 1:32 a.m. 19 hours 32 minutes. She started her first ultra-marathon in brutal conditions and finished 100 Kilometers. She couldn’t stop crying. Jade helped Emily get into dry clothes and soon after Emily fell asleep on a wooden picnic table. Bekah has finished! Against the odds, we now have 2 finishers! Bekah ran consistently and was determined to finish. There was no other option. Bekah too shed tears, who could blame her. She was a 100K finisher! Brian too has finished! He was the last 100k competitor to finish before the cutoff. He was the 61st finisher of the 100k. Less than half of the entrants made it to the finish. I staggered into Camp Remi. Chris was now handing me off to Jade. I could see them talking. I don’t know what was said, but I’m sure he was telling her I wasn’t doing well. I was dazed. I couldn’t focus. Jade told me to eat. I said I couldn’t. I asked if I could put my head down. She said for 2 minutes but then we’re leaving. I put my head down. I knew if I fell asleep I might not get going again. I was doing okay on time, but my cutoff time of 2 p.m. (Sunday) could become an issue depending on how much I struggled on the final lap. Jade brought me two pancakes and I nibbled on them. Forced them down. I asked my crew to fill my bottle with red bull and mountain dew. Normally not an advised concoction, especially after drinking a cup of coffee, but I needed any boost I could get. Leaving the aid station I was stiff and my head was foggy. But there was one thing keeping me going. Knowing that Bekah, Emily and Brian, came out here on my request, having never run more than half of the distance, and finished on an excruciatingly challenging day. They dug in and finished. I simply could not stop. Every time I had a low point on my final lap, I thought of them and how hard they worked. I made it through the night. The sun was rising for the 2nd time on my run. I was realizing I was going to make it. My quads hurt. Not the good hurt like you get from working out at the gym, the kind that feels like the muscle is tearing from the bone each time your foot slams into the ground. My feet ached. My back hurt. I was light headed on and off. But I was going to finish. I could feel it getting closer. I was past the final aid station, although nothing felt better, the excitement of finishing soon was starting to block the pain. Chris ran back and joined Jade and I for my final few miles. I ran up the final hill to the finish line. I was greeted to a cheering crowd, our crew and a Devil Dog finisher’s belt buckle. Emily was crying, and I teared up a little too. I was so proud of what everyone accomplished. And I was so incredibly grateful for Jade, Jodi and Chris who were so helpful to all of us! We could not have done it without them. Finishing Time: 28:44:42 22nd place. There were 114 entrants in the 100 mile race. 109 people started the race. 41 people finished. 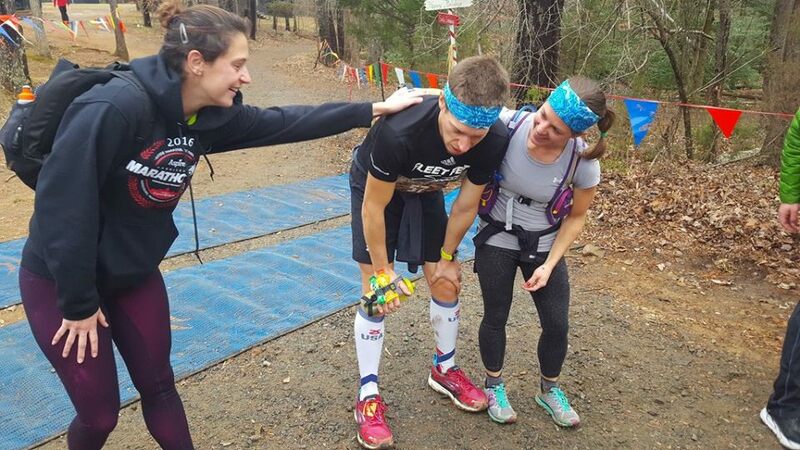 Most people with GPS had the course measured at 103 miles (common for a 100 mile race to be a little long, no one wants to finish 100 miles and find out they only did 99). A lot of people have asked me if I would ever do one again. Yes, but not anytime soon. As many of you know, I have a running streak, I have not taken a day off in more than 12 years. The rules of the streak is one continuous mile every day. I wasn’t sure that I ran a continuous mile on Sunday because by that point I was alternating walking and running and wasn’t running for very long at a time. So Sunday night before I went to bed, I actually ran one more mile. I’ll rest when I’m dead.